Im sure you have it memorized by now, but just in case, here is the map. Athletically, the abdominals primary role is midline stabilization, not trunk flexion. They are critical to swimming, running, cycling, and jumping, but never is their stabilizing role more critical than when attempting to drive loads overhead, and of course, the heavier the load the more critical the abs role becomes. We train our athletes to think of every exercise as an ab exercise but in the overhead lifts it’s absolutely essential to do so. 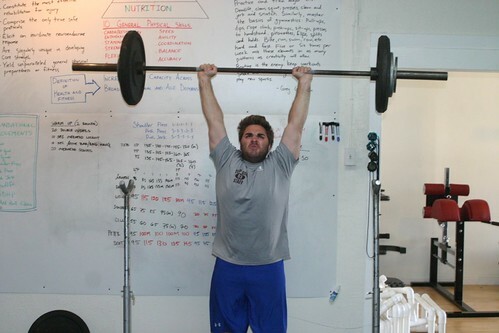 It is easy to see when an athlete is not sufficiently engaging the abs in an overhead press – the body arches so as to push the hips, pelvis, and stomach ahead of the bar. Constant vigilance is required of every lifter to prevent and correct this postural deformation.